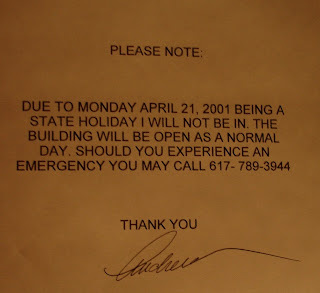 There are a couple of missing commas, no period at the end, and an extra space in the phone number, but the biggest problem with this sign is that the writer refers to today as April 21, 2001. For a second, I thought maybe I had entered a time machine instead of an elevator! I don't remember if I had Patriots' Day off in 2001, but I'm certainly at work today.